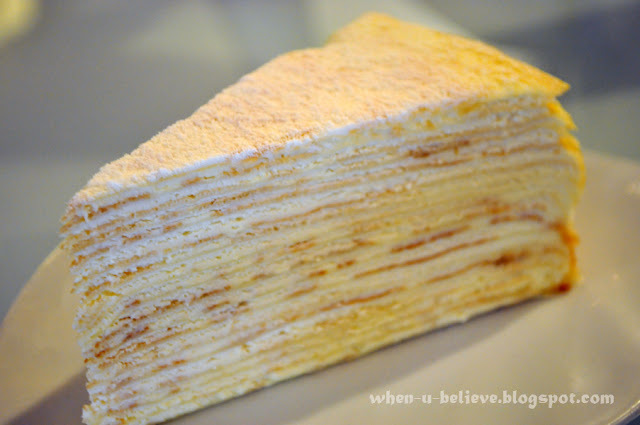 When You Believe: Wondrous Mille Crepe at Nadeje Café Sdn. Bhd. I've been craving for cakes a long, long time. This was my second visit here and I can't help myself from satisfying my sweet tooth at Nadeje Sdn. 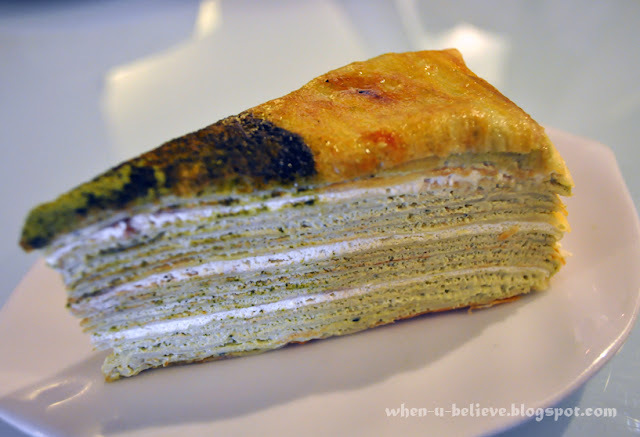 Bhd, famous for its mille crepe or also known as "thousand layers cakes". Mille Crepe is a French cake made of many crepe layers. “Mille” means “a thousand” in French, implying the many layers of crepe used. My first cake there was the Original Mille Crepe. The origin of Nadeje Mille Crepe, a cake made of custard cream with Tahitian Vanilla Beans mix with Fresh Cream. The layers worked wonders, with each melting smoothly in your mouth once you take a bite. The only thing that stays was the rich taste and aroma of the cakes. 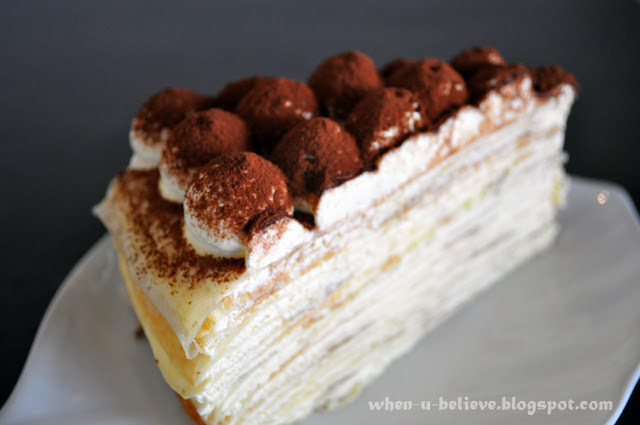 I prefer Tiramisu and the original Mille Crepe the most. It's light and creamy, as light as feather. Tiramisu - Rich profound taste of high quality Mascarpone cheese of Galbani, Italy. Cafe - Moderately sweet and aromatic taste of roasted Italian Coffee cake. Cheese - Freshness of New Zealand Cream cheese and home made Lemon Jam. 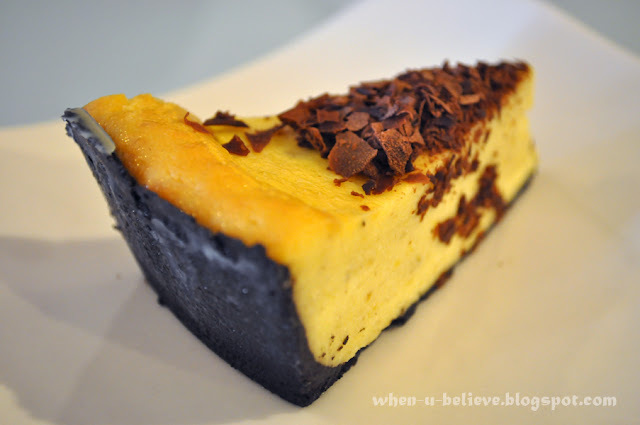 Chocolate Banana Cheese Cake - Harmony of home made banana jam and New Zealand cream cheese. 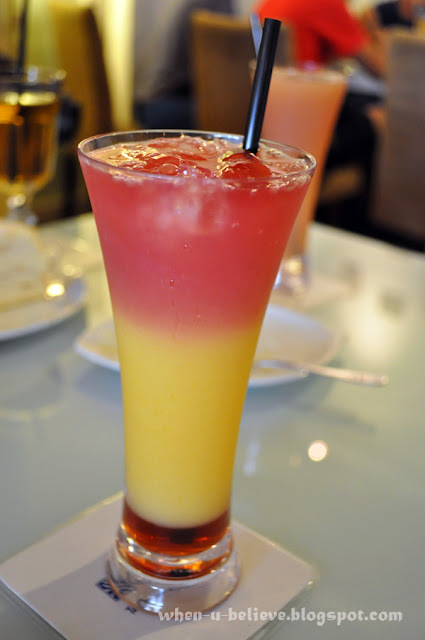 The drinks and beverages were said to made from fresh ingredient without any artificial colourings. 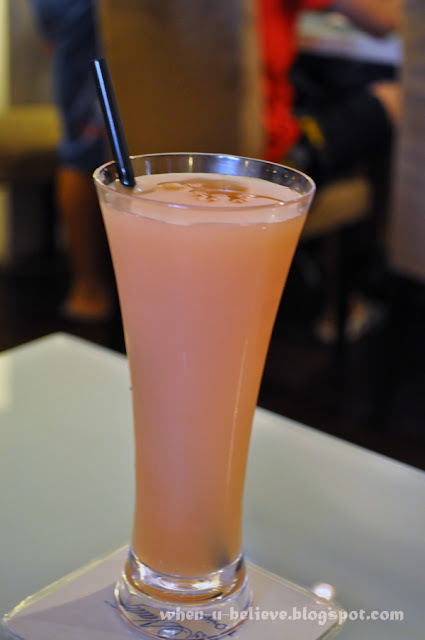 There are a wide variety of drinks for you to choose from soft drinks, teas (strawberry, berry berry, apple, etc), matcha milk, ginger ale, milkshake, yakult drinks, fresh juices,etc. This was my favourite of the drinks we ordered. This is not really of my liking. 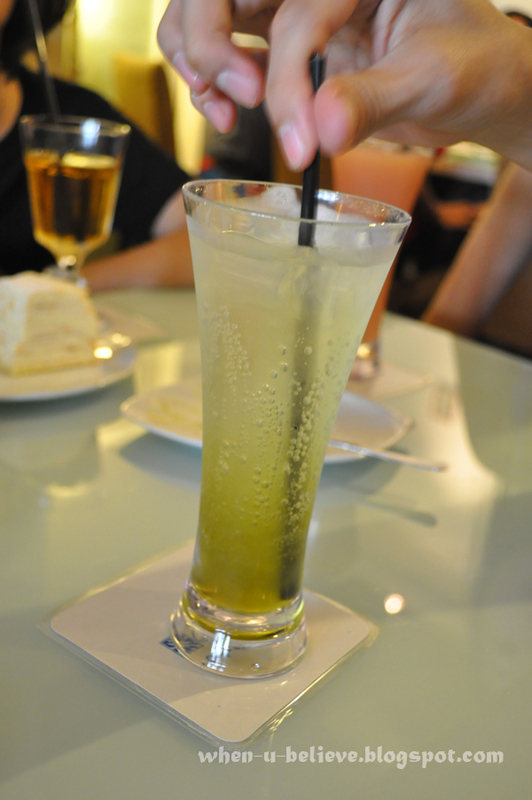 However, my friend prefers this though, it's fizzy, rather like Soda. Great for those who love soft drinks. 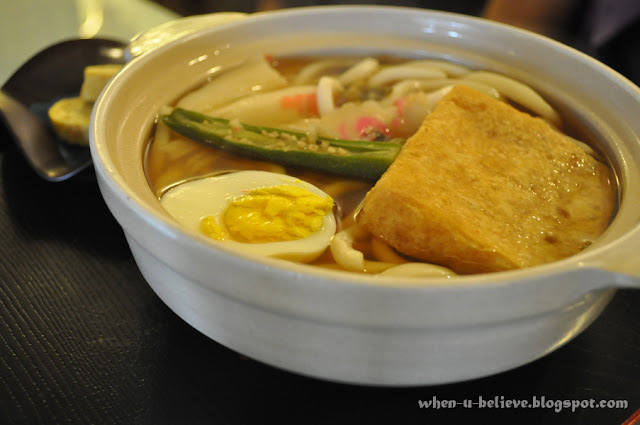 It felt great trying their salad udon after eating so much of strong spices and thick gravy in the past few days. Something light for the taste buds. 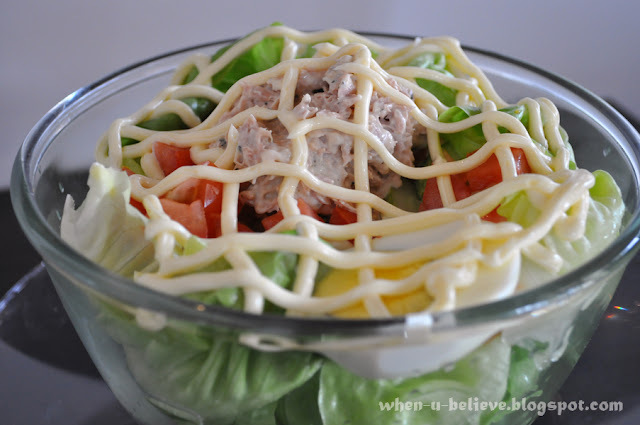 The Salad Udon - It's so fresh, love the vegetables, and light taste with mayonnaise as well as a little bit of tuna on top. The food was okay and the prices were affordable. Quite similar to those other chain stores and branches of cake houses or cafes. You'll need an ice box for take aways if you live far from the cake house. Bring it from home, or otherwise you can get it from the cake house. The cakes were priced at RM 8.50 per slice and RM 65.00 for a whole cake if I was not mistaken. For cake ordering, you need to place your order early, 3-6 working days are required to process your order. Oh, wow! ce qui est très délicieux! I'd love to have all of those cakes to go with my cup of double expresso (black without sugar). Maybe we can drive all the way down to Melaka just to sample a bit of heaven? Your food photos are excellent! But I heard rumors that they will be having a branch in Damansara, not very sure about that and when will they be branching here.